In America, it’s hard to build a business without millions in investment, but piggybacking off a wildly successful — if not imminently scandal-prone — company might help you carve out a niche. An Amish man in the small Michigan town of Colon has set his sights on the fertile rideshare business by offering transportation with a horse and buggy. It’s like Uber, but Amish. 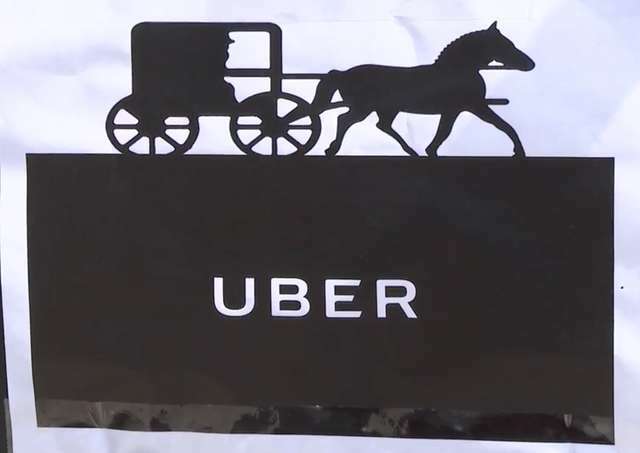 In fact, Timothy Hochstedler is calling his archaic taxi “Amish Uber,” even though there’s no app, or even smartphones or internet in his disconnected, little enclave of 1,200 people. Unlike the real Uber, with its surge pricing, “vomit fraud,” and history of courting controversy, Amish Uber is much more simple: Customers simply hail Hochstedler down on the side of the road — kind of like people have been doing since the inception of taxis — and pay $5 for a ride anywhere in town. Amish Uber: Man Starts Horse and Buggy Rideshare Service in Michigan – Thrillist.